Octoplush Musical Toy is rated 2.1 out of 5 by 8. 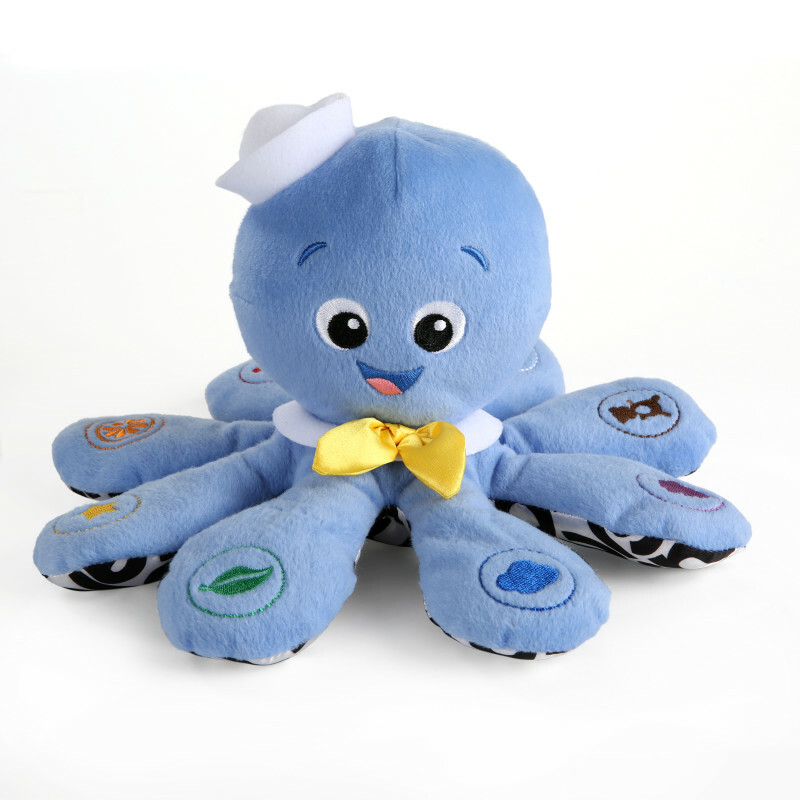 Octoplush the friendly baby octopus will take your little one on an exploration of color, music and fun. The plush activity toy from Baby Einstein is lovable and huggable, and every squeeze will introduce your baby to new colors and sounds. On top of each soft little leg, your baby will discover a colorful embroidered image. With a gentle squeeze you’ll hear the corresponding color and a short classical melody. Easily swap between English, Spanish and French so your little linguist can hear the colors in multiple languages. Plush stuffed animals like Octoplush are quick to enter a baby’s heart, and the friendship will only grow – a 2-year-old will love him as much as an infant! Dimension (in) 11" x 7" x 11"
Rated 1 out of 5 by Lew from I didn't buy this product. So glad I read the reviews before I wasted my money. The octopus is so cute. I'm sure there are more ppl like me that will do their homework before buying a product. Hope the company takes the time to fix any problems with their products to keep their customers happy and so they keep coming back. Word of mouth goes a long way. Rated 1 out of 5 by Jon from Stopped Working Properly After 2 Weeks Our son received the octoplush for Christmas. He loves pressing each of the octopus tentacles and the octopus' facial features. However, the product stopped working almost immediately. The eyes and mouth when pressed used to play music, but now the buttons don't work at all. Quite disappointed in this product's functionality. Rated 1 out of 5 by Mk mommy from Stopped working in less than a month! Our baby loved this toy at first, but now it doesn't play the music or colors when you press it. Instead, it plays the same 'error' tune regardless of what you press. He's only three months now so it wasn't like the toy was played with roughly or anything. So disappointed! Rated 5 out of 5 by blueskyinautumn from keeps our newborn entertained our daughter is 2 months old, i have offered this toy since she was born and she is quite attached to the soft blue octopus. she smiles and coos at him and loves the variety of music tunes he plays. Rated 2 out of 5 by Sonnys mom from It could be a great toy... My son loved this toy for a few weeks until it malfunctioned and repeats the same thing over and over, so I have to shut it off. He has enough stuffed animals; we liked this for the music.